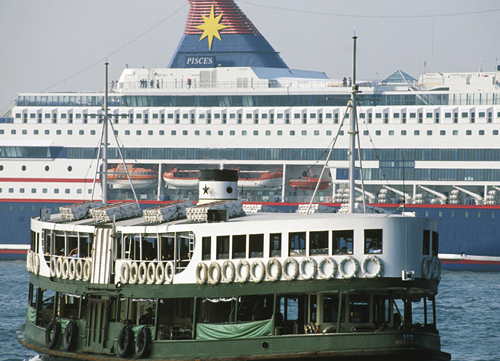 One of Hong Kong’s best-loved institutions, the Star Ferries have plied between Kowloon and Hong Kong Island since 1888. The portly green and white 1950s and 60s relics are still used by commuters despite the advent of rail and road tunnels beneath the harbour. A ferry ride offers a thrilling perspective on the towering skyscrapers and the jungle-clad hills of Hong Kong Island. Take an evening voyage for the harbour’s neon spectacle, especially the elaborate light displays at Christmas. The HKTB office in the Tsim Sha Tsui Star ferry building is the most convenient place to pick up brochures, get help and advice, and to buy Star Ferry models and other souvenirs. The Pacific Coffee Company inside the terminal serves a reasonable cup of coffee. Alternatively try the fresh lemonade and free cookie samples from Mrs Fields. In the early days, four coal-fired boats went back and forth between Hong Kong and Kowloon. Today 12 diesel-powered vessels operate, each named after a particular star (with the night-time glare and pollution, they may be the only stars you’re likely to see from the harbour). 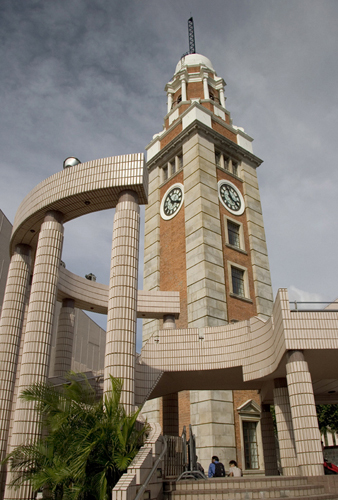 Standing next to the Tsim Sha Tsui Star Ferry, the landmark clocktower is the last remnant of the old Kowloon railway terminus. This was the poetic final stop for trains from the mainland, including the Orient Express from London. The terminus has since moved east to prosaic Hung Hom. Many Star Ferry crew members still sport old-fashioned sailor-style uniforms, making popular subjects for camera-toting visitors. Watch out, too, for the pier crewmen catching the mooring rope with a long billhook. 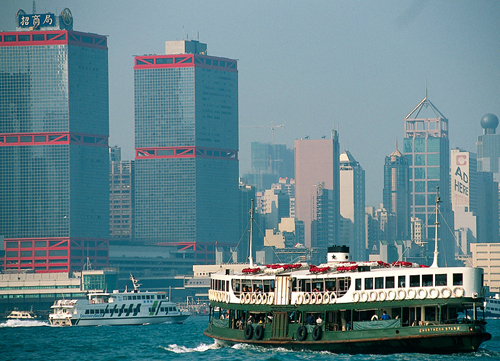 The Star Ferries run four routes: between Tsim Sha Tsui and Central; Tsim Sha Tsui and Wanchai; Central and Hung Hom; and Hung Hom and Wanchai. As you cross Victoria Harbour, on the far left are the glass and flowing lines of the Convention Centre in Wanchai and above it the 373-m (1,223-ft) tower of Central Plaza. Further left are the Bank of China’s striking zig-zags, and the struts and spars of the HSBC building. The new kid on the block is Two International Finance Centre , for now the island’s tallest skyscraper at a colossal 420 m (1,378 ft). 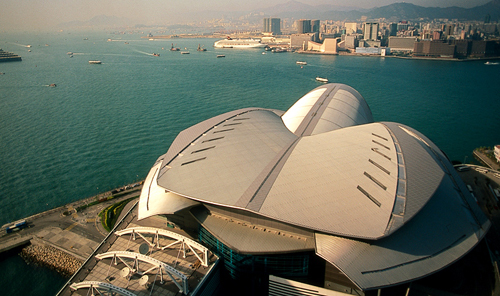 Victoria harbour is the busiest stretch of water in Hong Kong, teeming with activity. Keep your eyes peeled at the weekend for the last remaining batwing sailing junk to be found in this part of China. At HK$1.70 to ride on the lower deck and HK$2.20 to ride the top deck, the Star Ferry is Hong Kong’s best sightseeing bargain. The lower and upper decks used to be first (upper) and second (lower) class compartments. Today the extra cents buy access to the air-conditioning section during the hottest months, and afford a better view of the city and refuge from sea spray on choppy days. Just north of the Tsim Sha Tsui terminal, Hong Kong’s cruise ships dock, including the world’s most famous liners. Some US warships also dock here during port calls. 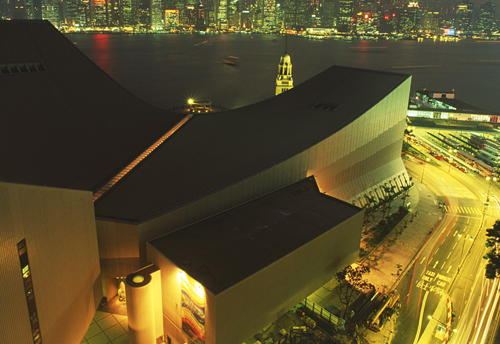 As you approach Kowloon with Hong Kong Island behind you, you’ll see the Arts and Cultural Centre, closest to the shore. Behind it rises the grand extension of the Peninsula Hotel and the tapering tower at No. 1 Peking Rd. The craggy hills of the New Territories loom in the background.